Body modification processes have become the norm. Medicine and technology have eased extensive body modification, and many are joining the bandwagon. Dennis Avner, more popularly known as Stalking Cat went through 14 surgical procedures so he could look like a tigress. Before his death in 2012, the 54-year-old was gunning for more surgeries to have ears like that of a tiger and the ability to walk on all fours. This may seem insane to the rest of us but the Stalking Cat once explained that the physical transformation was only a reflection of how he already felt inside. Thus, if a man sees himself in a certain way, you can't blame him for bringing that image to life, can you? Erik Sprague began modifying his body about 22 years ago. 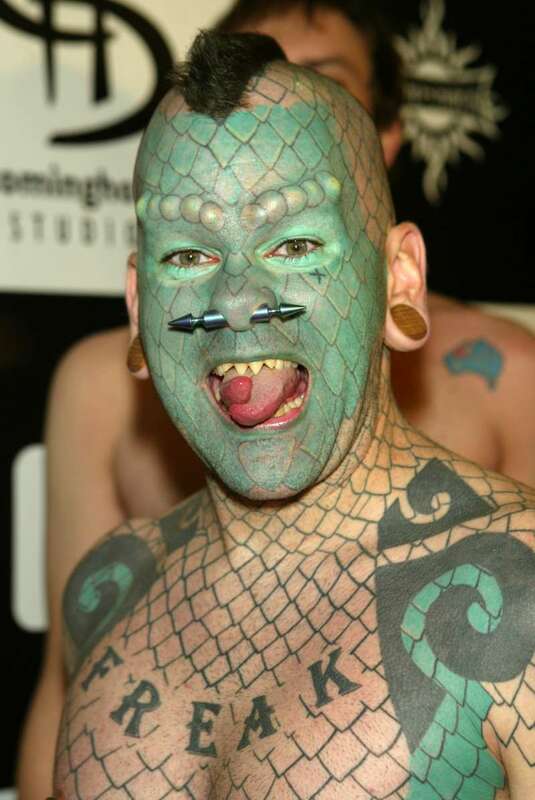 After 700 hours of full body tattoos, bifurcating his tongue to resemble that of a snake, getting implants along his eyebrows like the ridges of a reptile and filing his teeth, Lizardman the sideshow freak was born. He said the desire to modify his body was not a whim and his family understood him. They even saw it as the natural course of events due to his avid interest in body painting. After midnight. Technically my birthday. This is what 46 looks like. Speaking on his choice of a reptile, the performer said it was a lot like choosing which suit to buy. It just felt right but the only difference is that he gets to wear his suit for life. I never expected him to be so intelligent, knowledgeable, and well spoken. If he's happy with his life then good for him. Unfortunately, not everyone agrees. Some said he looks scary and wondered why anyone would do that to himself. Others believe his children would not want to look up to him. In as much as what you do with your body is your choice, Harvard Medical Blog warns of complications and infections that could arise as a result of the sharp objects, the ink or improper after-care. This is why it is imperative that one thinks before he/she inks.